You Can Find Maps Anywhere! Tonight I attended a public hearing on a Georgia Department of Transportation initiative that impacts some roads in my county. The hearing was held in a local church and as I walked out of the assembly hall I was struck by a familiar and friendly sight. 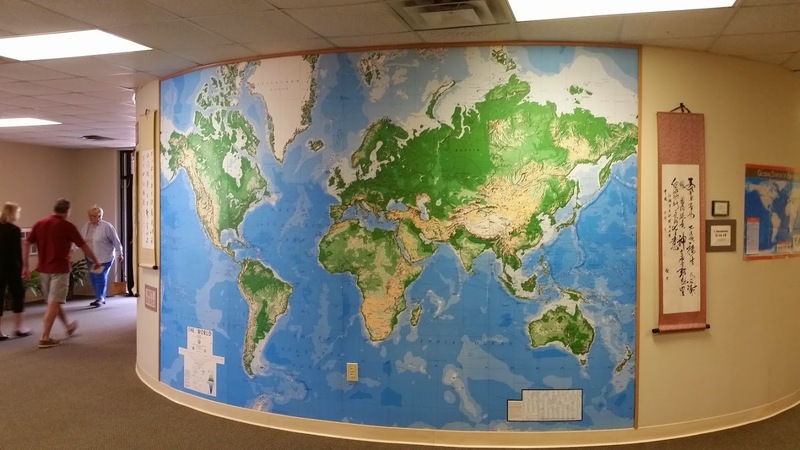 This is a wall-size map of the world produced by the old Defense Mapping Agency (DMA). The map was printed in several panels and was available for US military units to order through the local installation map warehouse or directly from DMA. The best part was, like all DMA products (maps, charts, catalogs and publications) these maps were free to the military. Order one or a hundred, it didn’t matter! These maps adorned US military headquarters all over the world, from Korea to Germany. They hung in briefing rooms and hallways all over the Washington DC area. You couldn’t claim to have a serious operations center without at least one of these hanging on a wall somewhere. The church apparently uses the map to track where their parishioners are from and where their missionary efforts are taking place. A wonderful use for an old war horse of a map. It was good to see an old friend again. This entry was posted in Army and tagged maps by Brian Haren. Bookmark the permalink.